Can I just say, I love our house. I like being surrounded by things that make me smile. It’s a little busy right now, with a growing toddler and a busy lifestyle, things do often get piled up on tables, and shoved into drawers, but looking beyond all the mess, I wanted to remind myself how lovely it is and so a new series of posts is born. Welcome to a corner of my house – hopefully once a month I’ll post an image of an area of my house and note down all the stories that are shown within it. The first is a small bit of our dining room. This photo shows the top of one of the two built in cupboards either side of the chimney breast. 1. This is a home-made collage of some photos taken from my grandmother’s house after she had died. There is a photo of their house, one of their garden, several of me as a baby and toddler (planting in the garden with my grampy) The one in the middle is of my great grandmother, my sister and me at my uncle’s wedding. I was four the day before and I still remember being so excited about having a hoop in the bottom of my dress! It also shows my sister picking her nose, which makes me laugh. In the top right, there’s a picture of me and my sister – I love this one. 2. These are Elliot’s footprints, taken when he was only a few months old. I remember thinking they looked quite big when they were done, but now they look tiny! 3. This is a beautiful tea tray given to us for our wedding from my sister and her husband (then boyfriend) It’s so ornate, and I love it! 4. This is a candle surround with crocus cut outs – I made it a local craft evening, Makeve, just before Christmas. It looks so nice with a candle flickering behind it. 5. This little wooden doll was bought in Tokyo while I was there for work. I love it as it reminds me of a past life, when I was an international jet-setter! 6. This lamp was another wedding present, and we’ve struggled to find a lamp shade to suit it – still not sure about the one we have, but it works well with the wall paper so perhaps it’s fine for now! 7. Should have taken a special photo of this actually, it’s Elliot’s Christmas hat from nursery. Covered in sequins (which get everywhere) but definitely something that will go in the memory box whenever I get time to tidy it up! 8. An iPod dock I got for Chris a couple of years ago for his birthday. This gets us bopping around the dining room and sets the tone for nice dinners! 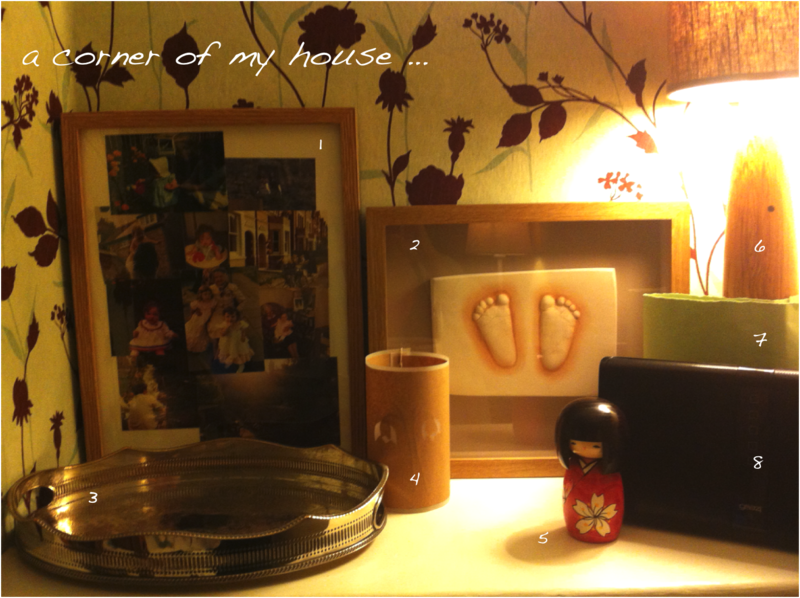 So there you go, a corner of my house….anyone else want to share a corner of your own? This entry was posted in Home and tagged corner of my house, memories, photos. Bookmark the permalink.